Religion as a coping mechanism and means of explaining the uncertain dates back to the beginning of mankind, people gathered together to learn and share their faith and their fears. Meeting places were soon designated to provide a location to comfort each other in times of sorrow, celebrate together in times of joy and serve as shelter in times of disaster. Temples, synagogues and churches are documented throughout history as symbolic icons of faith, great works of architecture that withstand the test of time. Building on a firm foundation is a key element of religion and religious facilities. Archangel Michael Coptic Orthodox Patriarch’s congregation of Howell, NJ decided to build a new church and considered many factors. They wanted a facility that would represent the long standing orthodox faith and the symbolic icons of the Coptic cross and circles. The circle represents the eternal and everlasting love of God. Christ’s halo was commonly depicted with cross-based halo in early and especially eastern parts of Christianity. The full cross symbolizes Christ’s crucifixion and resurrection. Rev. Father Ishak Shokry wanted a facility that would withstand time and grow with the congregation, which has grown to 120 families and over 360 members. But more than the congregation was growing, so was the maintenance and upkeep on their existing facility. They wanted a facility that would be able to serve more than their congregation and be virtually maintenance free with a long lifespan. Many types of construction were considered. However, tilt-up was the only way to achieve the design. Lindsay Lampasona, a concrete construction company with years of experience in tilt-up, was contacted to come and meet with the church committee. Lindsay Lampasona knows that with tilt-up’s diverse design ability, anything you can form – you can pour. They worked with the architects and the church committee to design and engineer panels that would provide the architectural look and the structural strength that only tilt-up can provide. From that first meeting, conception to completion, first service, was a mere 18 months. The forming of the panels was indeed a key component of the project, with most of the panels having an arched top and detailed recess/reveal components. There was also a curved panel with a tight nine foot radius which made up the alter. Since the floor to panel ratio was not adequate, 3 methods of casting were used; panels were cast on the floor, on casting beds, and stack casting was also done. There were 61 panels total on the project and 22 of them were unique designs. Yet the arched design and intricate reveals and recesses tied the panels together. The average panel size was 15’ wide by 35’ tall, with a couple 32’ wide by 37’ tall. The day the curved altar panel was erected, everyone took time for the father to perform a blessing. The Archangel Michael church had average panels of 50,000 lbs and the heaviest panels weighing in at 106,000 lbs, Lindsay Lampasona selected a 220 ton Lattice boom truck crane, American 9530, to meet the lifting and erection requirements. It took just 3 days to erect the panels to the amazement of the father, the congregation and the nearby neighbors, where once there was only a field, now a church stood. The biggest challenge on the job during forming was the complicated details including recesses, reveals, arches, curves and step-backs in the panels. The team utilized a variety of methods to achieve the look including having a cabinet maker cut the Coptic cross recesses using a CNC machine. Another challenge was erecting the two 45 foot tall towers. Each was made up of four panels as narrow as 8 feet! 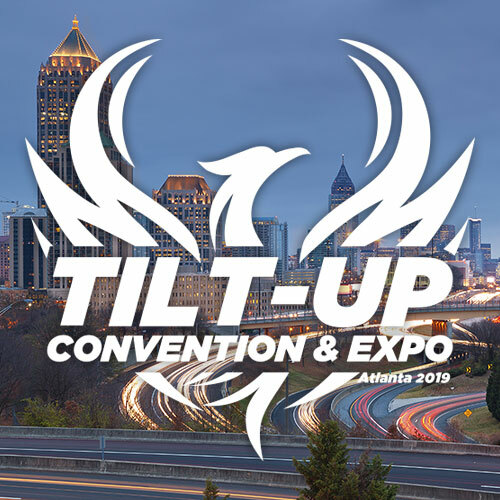 When asked “Why did you choose Tilt-up?” Rev. Father Ishak Shokry– answered very matter of fact – “It gave us everything we wanted, a strong structure that represented our faith, within our budget constraints and very quickly”. Archangel Michael Coptic Orthodox Patriarch church will hold it’s dedication service this spring. 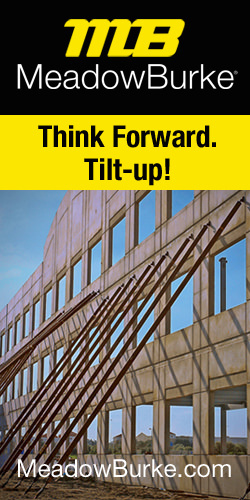 An entire community demonstrated their Faith in tilt-up construction.